Today’s outfit is the last that I’ll be sharing from my travels in Europe. I’ll be sharing more on what I did, where I ate and stayed so stay tuned! 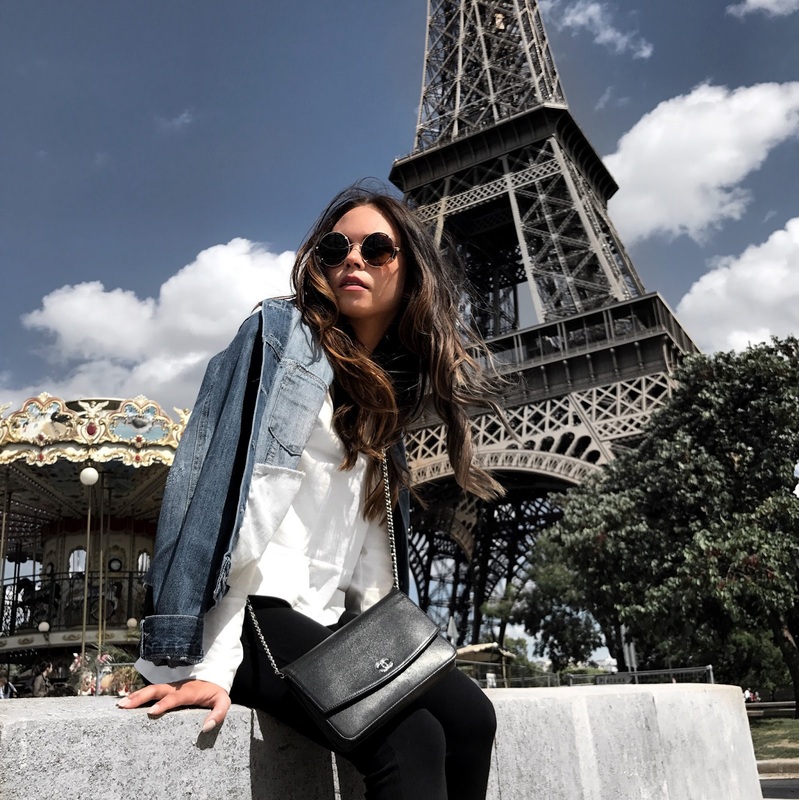 What better way to end my travel outfit posts than a trip to the Eiffel Tower! I was so excited to finally climb it because I missed out the last time I was in Paris. The hubby and I even managed to climb between the first and second floors twice by stairs! I definitely recommend seeing the Eiffel Tower from this vantage point if you plan on visiting. Since I knew the day would require a lot of walking, I wanted to choose an outfit that would be comfortable yet stylish. I also knew it would be a bit chilly on the Eiffel Tower so I made sure I dressed accordingly. These pants by David Lerner were the perfect choice because they had the fit and ease of Lululemon workout pants, without the look of a pair of workout bottoms. I also love how the flared pants made me look taller than I actually am. I paired my pants with a peplum sweater shirt but just as easily could have chosen a silk tank if it had been warmer. To complete the look, I threw on my oversized denim jacket to balance out the dressy look of the pants. I will most definitely be bringing these pants with me on my upcoming travels. They’ll work well on the plane, paired with sneakers or dressed up for a night out. Do you have an item of clothing that you bring with you whenever you travel? I love the simplicity of this look, and those pants!! Perfection! What a great choice to wear this pants. They look so comfy and also chic. Perfect for a Paris Trip. Love it. Have a wonderful day my dear. These pants look great on you! Love! Those pants are amazing! Love that they can be worn any time! The most perfect pair of travel pants ever! They look comfy and super chic at the same time. Love the outfit girl! I love all these looks, they are so adorable. Wow these photos from the Eiffel Tower are incredible! 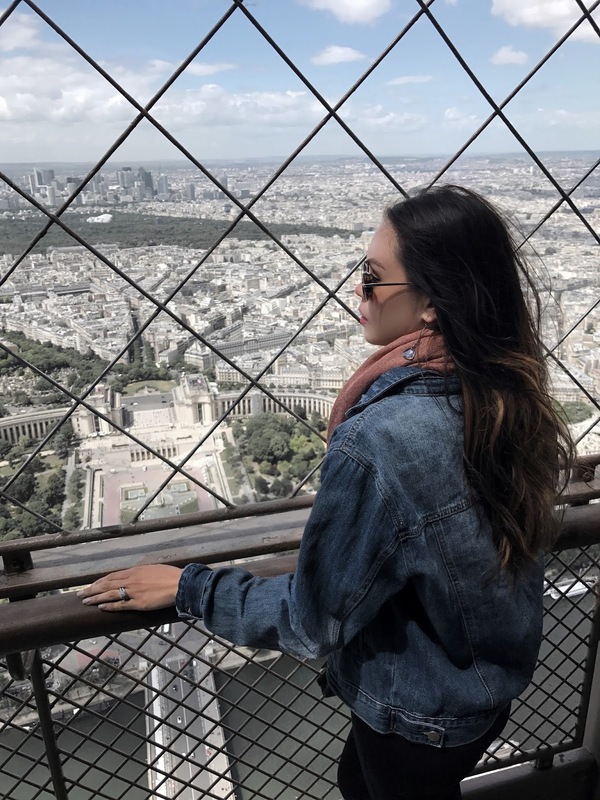 Can't wait to see more of your travel pics! and your pics are amazing! You pants look very comfy and elegant. And I just love your photos under the Eiffel Tower! Very romantic. I'm loving those pants! Definitely need to get those, since jeans can me so uncomfortable to wear a whole day! Love this look girl! And all your images are amazing! So jealous of all your travels! These pants look so good on you, babe! I used to love flared leg pants when in high-school and now they are fashionable again for a retro vibe ♥ Love the perfect balance between the dressy and casual pieces. I am sure your time in Paris was dreamy! I love your look from the trip gal. Beautiful. It's so important to have comfy trousers to travel in! Loving the snaps of Paris. This pants looks great on you. They look classic and comfy...lovely pictures by the way. These pants are perfect! I love your style and these photos! I love this style and the pants look great on you! Good for travel as well as many other occasions. The photos are very beautiful! You so simple, but super glam at the same time... I love your style Rina! And I love Paris too! Amazing pics and your look is great, love those pants! Paris is so wonderful!! Amazing pictures and outfit! As fotografias estão demais!! Amei tudo!! These look and sound like the perfect travel pant. Not to mention they look amazing on you! Oh these shots are just stunning! Your pants sound like the perfect choice for a day of exploring! So chic too! How I wish I could rock those sunglasses! I feel like the only style I look good in are aviators and a cat eye like sunnies. Anyway, your travel look was perfect and I can see how those pants worked out so perfectly! 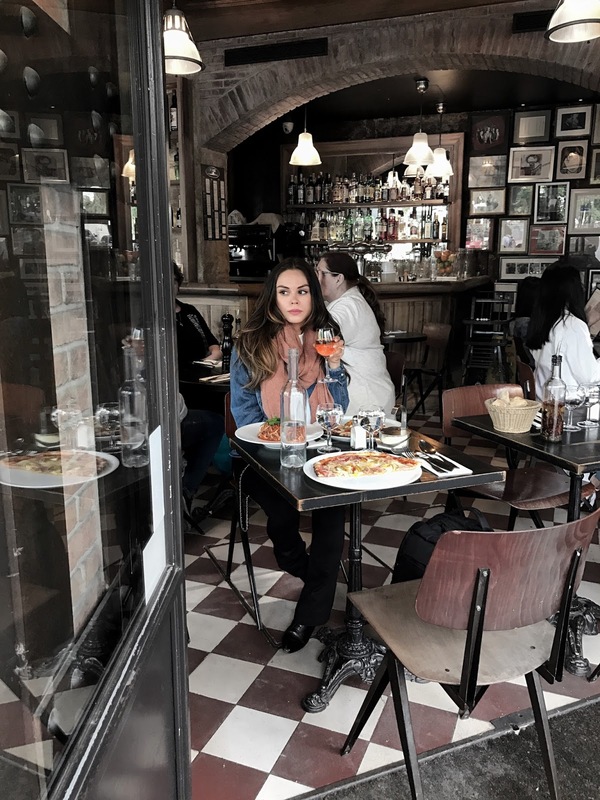 super cool paris photos! I like your style! Comfortable pants is definitely a must have for travel. I love that your pants can be dressed from day to night. You look amazing and your pics are stunning. 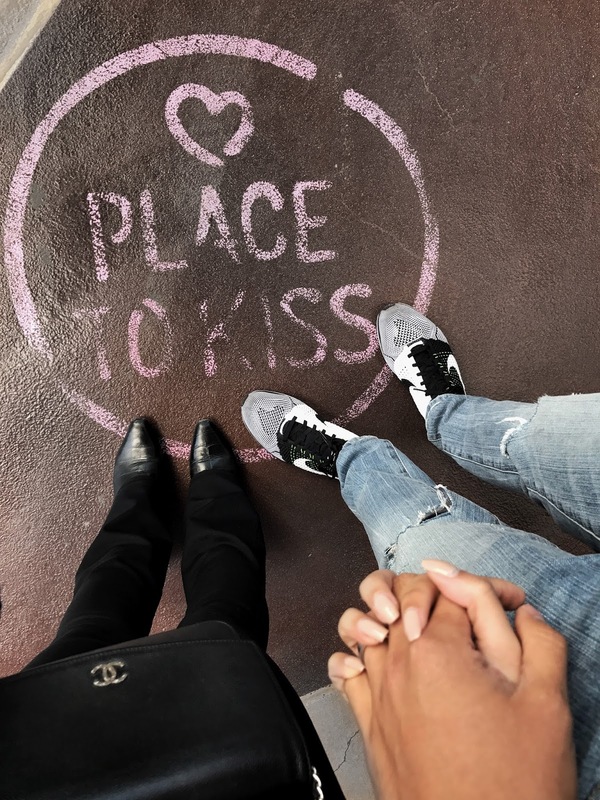 I'll be looking for "a place to kiss" when I am in Paris :) Enjoy the rest of your travels beautiful. Oh yes, this pants is a must have! I love the flared bottom!